Welcome to the Boeing 737 Technical Site. Here you will find technical, operational, and training notes; articles and photos contributed by 737 pilots and engineers from around the world. All of the information, photographs & schematics from this website and much more is now available in a recently updated 374 page printed book or in electronic format. Feel free to use anything here for your own personal use. If you are an organisation then please contact me for licence to use any of the images. Please note that I have a library of many thousands of technical images in high resolution. Please treat your company FCOMs as the final authority in case your aircraft have differences. 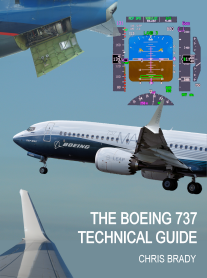 This website and the 737 Technical Guide have no connection to the Boeing Company. If you have any suggestions or corrections to any of the information here, please email them on to me and I will write them into the site for the benefit of other visitors. Follow the Boeing 737 Technical Site on social media using the links on the right to be notified of any updates. 09 Apr 2019 - Final report published into runway overrun of 737-800, 9Y-PBM, Caribbean Airlines at Georgetown, Guyana 30 Jul 2011. 04 Apr 2019 - The first MAX -10 fuselage, l/n 7644, has arrived at Renton. 18 Dec 2018 - FAA SAIB issued to warn operators to check the fuel control switches as some were installed with the locking feature disengaged. 16 Jul 2018 - Global Damojh B732 at Havana on May 18th 2018, Airline says FDR shows that crew stalled aircraft. 02 Jul 2018 - SAIB issued regarding inadvertent removal of Observer’s seat cupholder exposing P6-11 circuit breaker panel. 18 May 2018 - 737-200, XA-UHZ, operated by Global Air on behalf of on behalf of Cubana, has crashed shortly after take off from Havana, Cuba. 04 May 2018 - The NTSB have issued an investigation update into the SWA engine failure. 02 May 2018 - FAA issues new AD for the CFM56-7B requiring initial and repetitive inspections of the concave and convex sides of the fan blade dovetail to detect cracking. 25 Apr 2018 - Boeing issue reminder about the correct procedure for setting takeoff thrust following ATOs. 17 Feb 2018 - 737 MAX differences quiz updated. 16 Feb 2018 - The FAA have today certified the MAX-9 for commercial service. 13 Feb 2018 - FAA have issued Revision Number 60 of the 737 MMEL. Change revision summary here.